Mom, the Intern: This is my lucky dress. This is my lucky dress. So, this is my lucky dress. It found me (yes, it did) at Buffalo Exchange in Tempe. If you live in Arizona and have never been to Buffalo Exchange, you are missing out. There's one on University just west of Mill, close to ASU. It's a clothing consignment store where you can get practically brand new designer jeans for less than $20. Not even kidding. I usually pay between $10 - 18 for the jeans I get there. Sweet! At that price, you don't feel bad if you need to get them tailored (which is common for most human beings). Anyway, we went to Buffalo Exchange for my birthday back in April because I was searching for a decent pair of jeans. Remember that? And I did find some (the Banana Republic pair featured in Day 2). But as we were leaving the store, the beautiful print of this dress caught my eye, standing out amongst a crowded rack full of dresses. It practically called me over. I decided to check it out. 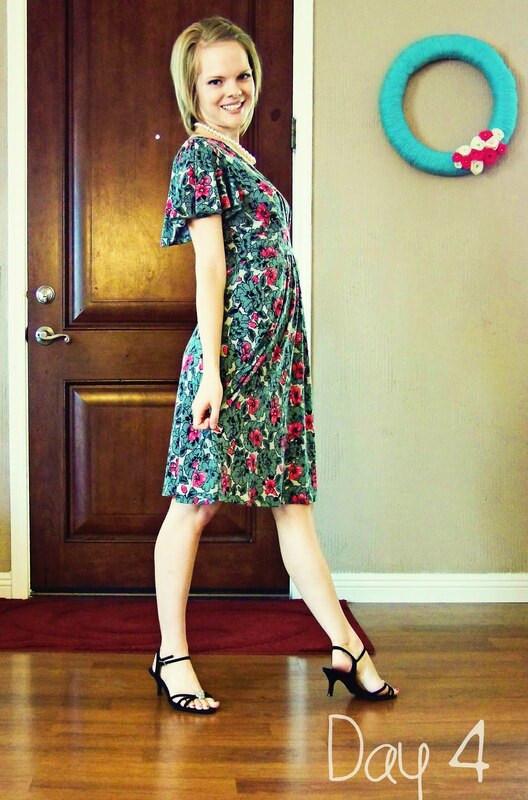 Whenever I come across a dress, I first ask myself three questions: 1) does it have sleeves? 2) is it long enough? and 3) is it cheap? Well, this beauty has some awesome flowy sleeves, perfect for Arizona's hot summers. And it's definitely long enough to be modest, but its at-the-knee hem is flirty and summery. And the best part? It only cost $14! Can't beat that. So there you have it. My lucky dress. Some things are just meant to be. As for YOU -- we reached 100 followers over the weekend! Wahoo! Apparently my own Dill was #100. How strange is that? You'd think he would have been my first follower. Oh well. Better late than never, I always say. I love layering but nothing beats a dress that you can just throw on and it covers everything. I find myself wanting more and more of those. Otherwise, Sunday morning is such a hassle trying to make it work. We have a buffalo exchange in Berkeley and most of the time Joel has better luck than I do since everyone at Berkeley is a hipster and female hipsters (hipsteresses?) don't wear a lot of sleeves. But I haven't been back in a while and definitely should! Woot woot! You hot mama you!